WITH Groovin The Moo festival becoming sold out a week before, there was a sudden mad scramble for spare tickets, or any competitions giving them away as it became the hottest ticket in town. Crowds began to gather outside the Hay Park before the gates opened at 10.30am, many of them campers who arrived early to set up their tents at nearby Kelly Park, catching the shuttle buses to the festival. Local Thrash band Silver Lizard kicked off proceedings on the main stage with a small crowd of loyal metal heads enjoying their brief but highly energetic performance. Triple J Unearthed winners The Words got the crowd dancing up a storm with their ironically titled EP headliner We Don’t Dance Very Well. Lead guitarist and vocalist Ben Macri and crew thanked everyone for getting there early before belting out hits like Go, Run For The Hills. He Didn’t Know and Got No Charm. As the lunchtime crowd began to swell, Harlequin League offered plenty of punk and heavy bass for the head bangers on the Myspace stage while those with a penchant for dance music and a desire to groove headed to the Moolin Rouge tent stage for Voltaire Twins followed by Jonathan Boule. Boule’s avant-pop set was well received - heavy on the instrumental flourishes and time changes, with the support of his three-pronged drum attack and infectious energy, he emerged a buzz-worthy champion. Kisschasy lead vocalist Darren Bordeaux remarked how great it was to be back on this side of the country as the band delivered its high energy single Do’s and Wahoo’s which set the crowd alight clapping in unison and signing their hearts out. Turnaround, Tarantula and Generation Why from their latest album Seizures were well received with the fans dancing in groups on the outer during Being Negative as well as during Spray on Pants and Strings and Drums. With some suggesting he might be sick, IllY delivered a performance that was ‘fully sick’ in the tent stage producing a lot of heat and sweat as he busted out Long Story Short and We Don’t Care with the crowd responding with plenty of hand bouncing with a call and response that impressed cohort DJ Phase scratching up the decks. The crowd sang along with gusto during Picture in My Wallet, but there were still more surprises in the Moolin Tent. Folk poppet Lisa Mitchell bought a chilled out vibe to the Triple J stage and opened with the infectiously catchy Clean White Love, before slipping into the melodic Oh Hark! As the audience clapped and sang the hook line of the chorus. Steve, So Jealous and Neapolitan Dreams were both crowd pleasers as was her big hit Coin Laundry and thankfully no coins were hurled at the stage by over zealous fans in previous outings. Melbourne’s British India pumped up the volume and the tempo when the crowd swelled for a rousing performance of Run the Red Light and their rocking hit tie up Your Hands. The mosh pit came alive during I Said I’m Sorry, accompanied by plenty of clapping in unison and pogo-in. The punk riffs in Because of You saw plenty of heads nodding in approval and lads carried the energy through with their latest single More Ways to Live Your Life. The opening chords of a familiar song suddenly resulted in a huge sing-a-long to a cover of Nirvana’s anthem Lithium – which was well received by the Gen-Xers as they rubbed shoulders with the Gen-Y’s. Those with energy to burn got the chance to spend it during This Dance Is Loaded with other hits like Vanilla and God Is Dead Meet The Kids rounding up the blistering set. International artists Spoon played a fantastic greatest hits-esque set for a largely older and more dedicated audience. With the tightness of a funk band and Britt Daniel’s effervescent personality, Texas’ finest were all about melodies, harmonies and brilliance. As The Way We Get By, I Turn My Camera On and Got Yr Cherry Bomb melded together into a wonderful collection, it’s clear just how talented the Austin quartet can be. Those unfamiliar with the spooners headed to the Moolin Rouge tent to jump around to the likes of Funkoars, who played some Hilltop Hood covers and heavy bass hip-hop tunes with special guest appearances by Drapht and MC Suffa. You could listen to Tegan and Sara all day and if hadn’t promptly started on the adjacent stage, we probably would have. Drawing one of the biggest crowds, the Canadian twins proved their mettle with spot-on dual harmonies and some seriously rocking tracks of their last two records Sainthood and The Con. Crowd favourites included Back In Your Head, Hell, Night Watch and plenty of singing was abound during Alligator. The sisters engaged with the crowd and event made a short video recording on their iPhones to send back to their mum in Canada – and their delightful harmonies during Soil Soil and The Ocean were a big hit with their fans. Grinspoon showed the crowd why they have been on the circuit as long as they have, and pulled out lots of oldies but goodies in their smoking set. Lead vocalist Phil Jamieson was on fire belting out Already One, Dogs and Kills Thrills and Sunday Pills, which sent the mosh into euphoria with a couple of crowd surfers vying for top position. Other well received hits included Chemical Heart, the vocal straining More Than You Are Come Back and Premonition were also well received. ARIA darlings Empire Of The Sun delivered a very artistic, borderlining whimsical performance, where singer Luke Steele’s new creative project received a mixed reaction from the audience. Backed by dancers sporting a series of bizarre costumes including swordfish heads, Steele played a thumping rock/electronica set that sounded similar Prince, minus the Samurai headdress. Without the collaboration of partner Nick Littlemore, Steele performed the group’s biggest hits such as Walking On A Dream, Without You, We Are The People and Half Mast Slight Return, with the crowd looking confused who they should applaud - the performer or choreographer. Vampire Weekend – what a lovely close to the evening. In a world where every outfit is trying to out-do each other in terms of aggressiveness, coolness and indie-props, these college boys are content to just play their tunes. With riffs that have flavours of pop, reggae and soft rock, the New Yorkers charmed the Bunbury audience with their hits Oxford Comma, Cousins and Giving Up The Gun. Everyone present could not help but groove along to Cape Cod Kwassa Kwassa and Campus. The Vamps were possibly the highlight of the festival for the credence who like anything with kitsch value – until the next flavour of the month drops in. 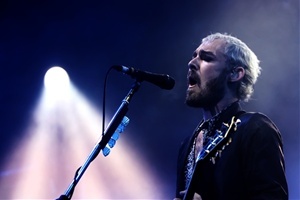 With a soft rain falling on the audience, Silverchair delivered a blistering performance that let everyone talking for more reasons than one. Daniel John, looking happier than usual, was in fine form as he dropped random words of wisdom during the brief breaks in between songs, including hits like Emotion Sickness, Without You and The Greatest View. There was a bit of nostalgia present for Israel’s Son and The Door from the lad’s debut album Frogstomp. Dressed in a West Coast Eagles kit, drummer Ben Gillies showed his prowess during If You Keep Loosing Sleep and Anna’s Song (Open Fire). Johns took every opportunity to mess with the effects pedal, howling into the microphone for no apparent reason. The crowd was in hysterics when Johns stopped the band mid way during Freak to scold a couple of naughty boys fighting in the front. For the inaugural Groovin The Moo festival, this was one of the most fantastically organised gigs that hopefully will do for Bunbury what Southbound as done for Busselton. Punters should be very proud of the way they handled themselves.